There once was a curious rabbit living within a quite huge park grounds of a far away big city. There life turned out to be easy with lots of trees and bushes, diverse flowers and tutored lawns. Only the crazy two-legs were disturbing the rabbit a little bit while they occupied his admired park all day long. Early in the morning each day bunny was always surprised when observing the tall two-legs running through the park without real aim, while others of this species were just slowly walking in a very artificial and weird style – probably delegates of the ‘Ministry for Silly Walking’. But in the night all was just fine and quiet, because then bunny could use any desired place in the green. One night shortly before full moon the rabbit strolled around the park and finally reached an old oak-tree. A real great hunger had led him to this place where odd plants had emerged from the ground never seen before. These strange looking fungi looked like small red umbrellas with white points on the upper side, and the pale light of the moon let the toadstools even gleam more seductively. And bunny was so hungry that he straightway swallowed up two of them. A strange feeling broadened in the belly of the rabbit who did not really care about that. Half an hour later it all began, the moon resembled suddenly reddish, the sky immersed in a bright orange while all trees and bushes were covered with sparkling blue layers of light. Wow, what an amazing show tonight, thought the rabbit. But the visions changed quickly, there was a metro tunnel to be crossed, and after the metro tunnel bunny discovered a busy municipal motorway where the wild animals of the forest were ferociously racing down the road towards the horizon. Astonishingly none of the two-legs was present here because this would have been an ideal place for running and silly walking – strange two-legs hard to understand for a small rabbit. It was like in a cinema, and the very next moment bunny was captured by a tremendous canyon. Now walking and climbing over heavy rocks seemingly for many hours, the rabbit dreamed of his nice park where all had been so nice and tidy. 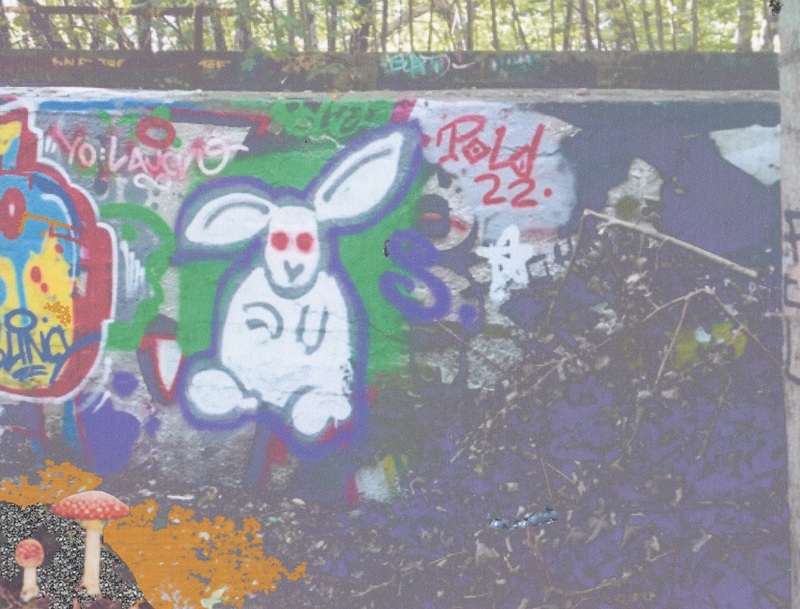 Subsequently he reached a painted wall at the end of the gorge where bunny did quickly fall asleep. Multiple mad dreamings pursued him all over the night, so bunny was really happy when the first rays of the sun waked him up next morning. Still dazzled by the adventures of the night he found himself again in his beloved park where nothing had changed so far. So he decided instantly not to taste these toadstools again in his further life.